The Fiamma Front Blocker Panel is a convenient and easy to use a front panel to give you more privacy and protect you from sun light and rain. It is suitable for the Fiamma F45S, F45L, F65, F65L, F35 Pro and Caravanstore awnings. The Kit Side allow installation of Side W Pro F45, Side W Pro Shade and the Sun View Side F45 on F65 awnings and on Omnistor 5002/5003/4900 and Tristor/Tristor2 awnings. The Fiamma Side W Pro is an easy to use side panel to give you more privacy and protection against the elements. Made of anti-rot washable vinyl fabric, it attaches via the included telescopic rafter and ties down using the elastic hooks and pegs provided. With one large full-light crystal window and a vinyl extension to the ground, it creates added privacy for your Fiamma Caravanstore, F35 Pro, F45 or F45 (VW T5) awning. The Fiamma Side W Pro Shade Panel is an easy to use side panel giving you more privacy and protection against the elements. 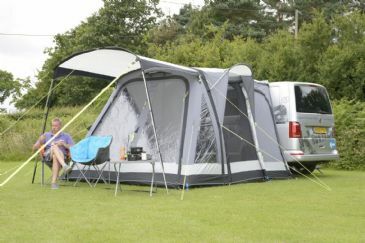 A great addition to the Kampa Revo roll-out awnings and also suitable for most popular roll-out awnings on the market. The Sunscreen offers extra privacy whilst also protecting against the sun and wind. Complete with 4mm and 6mm keder.